The thermodynamic stability of the furoxan ring annullated with 1,2,3,4-tetrazine 1,3-dioxide cycle was studied. 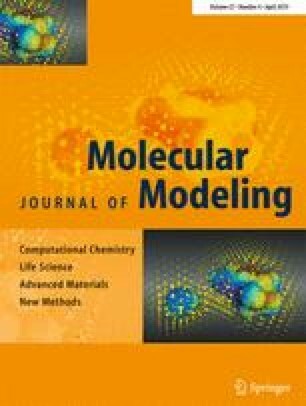 Crystal structure prediction based on global energy minimization in the framework of the atom–atom potential functions method was performed for isomeric furoxano-tetrazinedioxides (FuxTDOs): [1,2,5]oxadiazolo[3,4-e][1,2,3,4]tetrazine 1,5,7-trioxide (1) and [1,2,5]oxadiazolo[3,4-e][1,2,3,4]tetrazine 1,4,6-trioxide (2). The Coulomb energy was calculated with advanced point charge models fitted with high accuracy to the molecular electrostatic potentials of these molecules. The pressure and velocity of detonation of compounds 1 and 2 were estimated using the calculated enthalpy of formation and predicted molecular crystal density, which allows us to consider these compounds as high energetic materials. The online version of this article ( https://doi.org/10.1007/s00894-019-3986-7) contains supplementary material, which is available to authorized users. The authors thank Dr. A. Dzyabchenko for providing the copyright software packages FitMEP and PMC and for considerable assistance in their use.